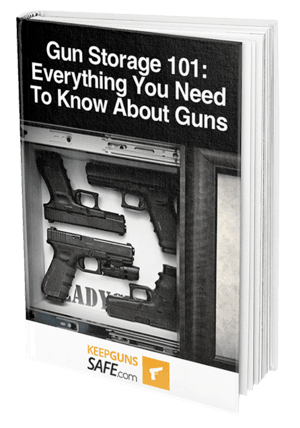 There are many reasons why it is important to ensure you properly store your guns. There are some states in which it is the law to store your gun properly. You may be subject to fines if you neglect to purchase a gun safe or similar product. Storing your gun is not only a way to ensure that you and your family are safe. It is a way to make sure the whole community remains safe. The number one source of firearms for convicted felons consists of stolen guns which are resold. A stolen gun allows anyone to bypass the rigorous background and record checks which are necessary for many states. There is also the simple fact that guns are expensive and it would be a hassle to have to purchase a new one. Finding the ​best safe for handgun storage ever​ takes some consideration. You will first have to consider how many guns you own and how you plan on fitting them in your safe. Some safes will have enough room for up to 10 handguns. But, they will necessarily be larger than average. Some of the guns may not be readily accessible until others are removed first. 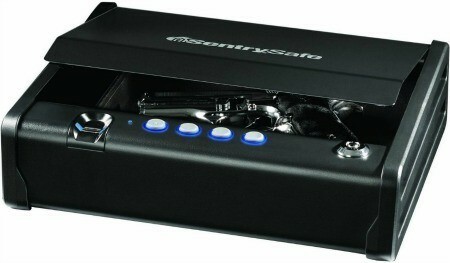 There is also the matter of investing in a safe which is convenient in the event of a home defense situation. Gun cabinets are primarily meant to be a means of storage for your weapons. You will find that gun safe is the better option when you have to defend your home at a moment's notice. 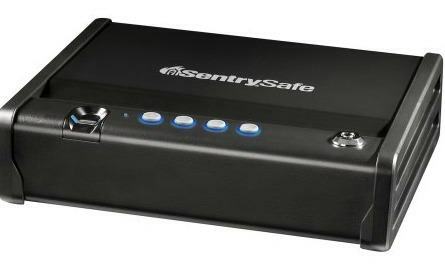 Before we start our review of the SentrySafe Biometric Quick Access ﻿﻿gun safe, we will take a look at two of the characteristics or features which contribute to making it such a great product. When opting for a gun safe that makes use of an electronic lock, you will find that the inclusion of an override key is almost a necessity. An override key will always provide a mechanical way of opening up your gun safe in the event of the battery dying or a malfunction with the electronics. It is usually a good idea to keep the override key somewhere hidden yet relatively close to your safe if the lock malfunctions during a home defense situation. This way you can ensure you will not be left unarmed in the worst case. Another thing to consider when you are making you gun safe purchase is how much storage room you have available inside your gun safe. This factor allows you to ensure there is enough room inside the gun safe for each of your guns as well as some magazines and ammo. 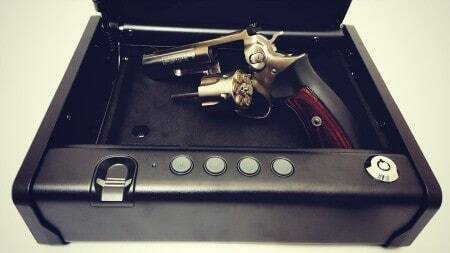 A gun safe can also be an excellent area to store your gun cleaning tools. You may wish to invest in a safe which is a little bit bigger than just your gun. Of course, the interior space is directly correlated to the exterior size of your gun safe. You will have to balance your needs regarding inner and outer size. 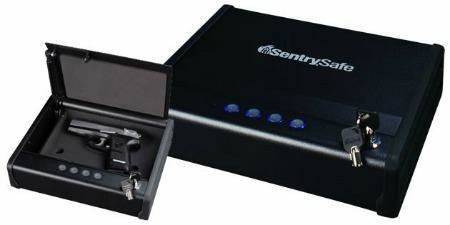 SentrySafe is the developer and manufacturer of the Biometric Quick Access Gun Safe. This model of a gun safe is designed to be easily accessed under duress and to provide a biometric safe at a reasonable price. If you value a safe which exhibits these features, then you will probably be a fan of this model. There are many features which contribute to this safe being ideal for home defense situations. First, we will start with the most obvious one: the inclusion of a biometric fingerprint reading lock. This lock is both simple to use and quick to open, allowing you access in under a second under ideal circumstances. The inclusion of an override key ensures you will never be locked out of your safe with your gun in an inaccessible position, provided you don't lose the override key itself. There is also a gas strut which ensures that your safe will open quickly and that it will stay open so you can access it with one hand in a pinch. This safe is relatively small, featuring only enough interior room for a single handgun and a few accessories. It may not be the best choice for a gun safe for owners with more than a single handgun. If you already have a gun cabinet, however, and you only need a quick access safe for home defense, this is a great choice. We also looked at customer reviews and testimonials so we could get a better idea of what customers experience with this model of gun safe. Most buyers were impressed by the inclusion of a biometric lock for such an affordable price, and one which works properly, at that. Regarding negatives, there were many complaints about the battery life of the lock. Customers stated the batteries only lasted a couple of months. As we did not have enough time to measure this over the course of our review, this revelation was somewhat disappointing. This gun safe costs about 150 dollars. This is one of the lowest prices you will find a biometric safe available for. This model can be found for sale on Amazon and other similar sites. We hope that this review has helped you decide on whether or not you would like to own this particular gun safe model. If you have any questions or concerns, please leave them down in the comments below.